Pin-up: what is that? : Retro nails in Dita von Teese style? Huh, that`s easy! 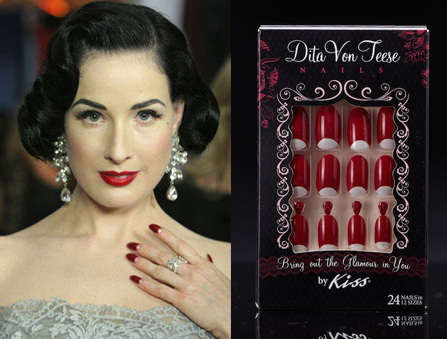 Retro nails in Dita von Teese style? Huh, that`s easy! But frankly speaking, I`m a huge fan of leaving "the half moon" area unpolished, as for me, it looks better. And It is the style that I`m going to show you now. I will show you a very easy way on how to do that, because It can be quite hard to "paint" this style. This trick will make the process faster and without any mess. All you will need: nail polisher (I used Colorama by Maybelline, colour 150) and a TAPE. That is the key ingredient to our look. Repeat this step on every nail. Then apply a nail polisher. You can do a base, of cource, and then do the actual colour. Make sure that the tape is placed well on every nail and not sticking up anywhere. It doesn`t matter if you do a mess, everything will remain on the tape. If you need, cover the nails one more time. When the polish is almost dry, you can start pulling the tape off. Be attentive here: pull the tape straight down towards your hand- not over your nail. Pulling it over might tear more of the nailpolish off, and it is not what we want. If some areas look messy, dont be upset, just take your rounded craft brush, take a nailpolish remover and try to fix everything!You can use it to remove the polisher on the sides of your nail as well. And here is the result! Nice and neat! And also quite fast.